UEFA Champions League. Kick-Off: 5.55pm, Tuesday 23rd October. 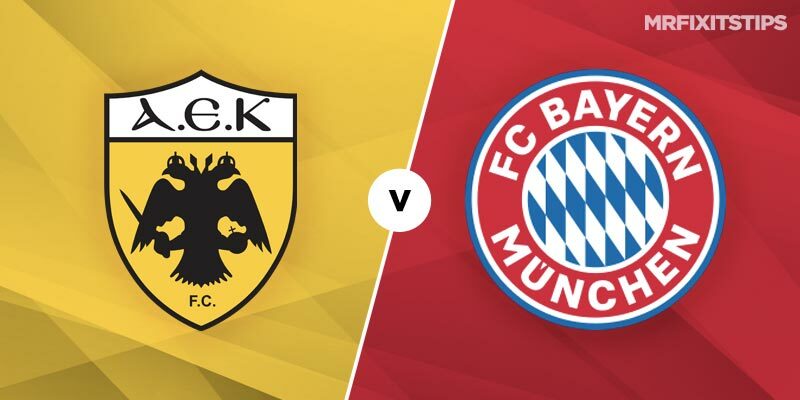 BAYERN Munich have the chance to put their indifferent form to bed with a victory in Greece on Tuesday evening when they play bottom side AEK Athens. A 3-1 win at Wolfsburg was Bayern's first in five, helping them keep Bundesliga leaders Borussia Dortmund, who are four points ahead of their Bavarian rivals, in their sights. Such was the pressure on boss Nico Kovac that Bayern's big wigs held a press conference on Friday to give him a public vote of confidence. They cited the fact that creating chances wasn't the problem, but finishing them was. And they're right. In Bayern's last five they've had 84 shots on goal (16.8 per match), 30 of which have been on target, leading to just 5 goals. It could be that a hammering for someone is just around the corner. And that someone could be AEK Athens. The Greek champs have lost three goals in each of their two Group E matches so far and sit pointless at the bottom of the table. Like Bayern, AEK find themselves in fourth in the Greek Super League.On paper their 3-2 defeat to Benfica looks creditable enough and the comeback from two-down was impressive but by that point the Portuguese were down to 10-men. Bayern represents another step-up in class and that's represented by odds of 14/1 on the home win. I can't see anything other than a comfortable Bayern win here and wouldn't be surprised to see the Germans rack up some goals. Despite Bayern's poor run of results they often reserve their best performances for Europe. Back Kovac's men to match Ajax and Benfica's goal tallies against AEK by scoring three or more at 10/11.